Size of this PNG preview of this SVG file: 432 × 599 pixels. Other resolutions: 173 × 240 pixels | 346 × 480 pixels | 432 × 600 pixels | 554 × 768 pixels | 738 × 1,024 pixels | 1,550 × 2,150 pixels. English: Tierced in fesse the first and second divisions containing the quarterly coat following, namely, 1st, gules three lions passant guardant in pale Or, 2nd, Or a lion rampant within a double tressure flory-counter-flory gules, 3rd, azure a harp Or stringed argent, 4th, azure, three fleurs-de-lis Or, and the third division argent three maple leaves conjoined on one stem proper. And upon a royal helmet mantled argent doubled gules the crest, that is to say, on a wreath of the colours argent and gules a lion passant guardant Or imperially crowned proper and holding in the dexter paw a maple leaf gules. And for supporters on the dexter a lion rampant Or holding a lance argent, point Or, flying therefrom to the dexter the Union Flag, and on the sinister a unicorn argent armed crined and unguled Or, gorged with a coronet composed of crosses-patée and fleurs-de-lis a chain affixed thereto reflexed of the last, and holding a like lance flying therefrom to the sinister a banner azure charged with three fleurs-de-lis Or; the whole ensigned with the Imperial Crown proper and below the shield upon a wreath composed of roses, thistles, shamrocks and lillies a scroll azure inscribed with the motto A mari usque ad mare. The circlet of the Order of Canada was added around the shield for limited use in 1987, and for general use in 1994. 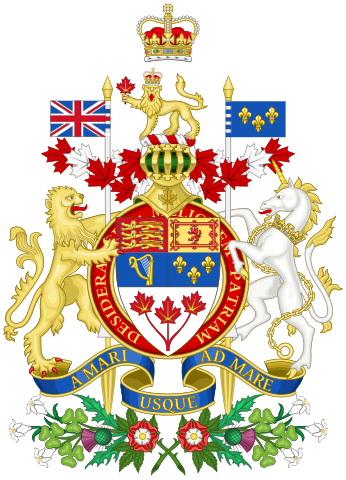 English: A rendition of the current Coat of Arms of Canada, different from the official rendition but no less correct. Please use the official version (Coat of arms of Canada.svg) where fair use reasonably allows it. 23:33, 24 February 2014 1,550 × 2,150 (1.67 MB) Echando una mano (talk | contribs) Yelmo forrado de sinople. 23:05, 24 February 2014 1,550 × 2,150 (1.67 MB) Echando una mano (talk | contribs) Lambrequines en forma de hoja de arce y mayor tamaño de la cimera. 22:50, 23 February 2014 1,550 × 2,050 (1.72 MB) Echando una mano (talk | contribs) Pequeñas modificaciones visuales. 20:46, 31 August 2013 1,602 × 1,996 (2.22 MB) Tom-L (talk | contribs) Maple leaf lambrequins. 20:07, 31 August 2013 1,602 × 1,996 (2.25 MB) Tom-L (talk | contribs) New, broader order. Thicker outlining. Cleaned definitions and unused elements.